Felicity James appeared on Show 289, recorded in April 2014, at age 17. Felicity James (violin), 17, is from Seattle, Washington. She studies violin with her father, Simon James, assistant concertmaster of the Seattle Symphony. Felicity has performed as a soloist with the Seattle Symphony, Spokane Symphony, Coeur dÕAlene Symphony, and Ottawa Chamber Symphony. She received a Dorothy Richard Starling Fellowship to participate in the 2013 Aspen Music Festival and School, where she studied with Paul Kantor. 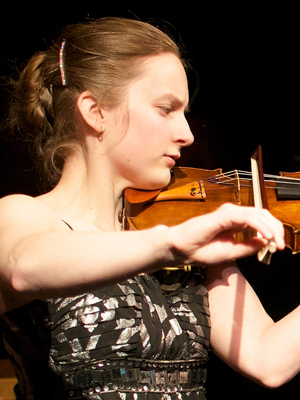 Felicity was a prizewinner in the 2013 Stradivarius International Violin Competition, and a first-prize winner in the 2013 Musicfest Northwest, the 2012 Washington State MTNA Competition, and the 2012 Seattle Music TeacherÕs Simon Fiset Competition. She participated in the 2012 New York String Orchestra Seminar and was a finalist in the 2012 Stulberg International String Competition.